Happy Halloween everyone! Recovering from the weekend ok? Checked out the White House Trick-or-Treaters photos? 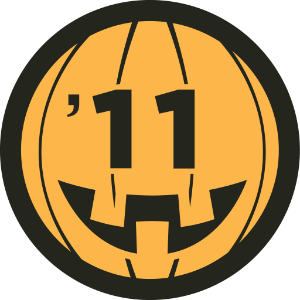 Checked in on Foursquare to get your Halloween 2011 badge? Excellent, everything appears to be in order, then. Not that any of it matters, since Halloween is today making everything you did over the weekend fun, but a bit premature, null and/or void.1 Weekends are great for those living in the Material World, but spooks, spirits, specters and ghosts are on a much more precise timetable and tonight is their night! Still, forewarned is forearmed so I give you the following educational video2 from Look Around You on the subject of Ghosts. 1 Except for the hangovers and walks of shame, sadly those were real and have most likely already been documented on Facebook or Tumblr. 2 Watching this video will count towards your classwork, so take notes as there may be a quiz later. Previous story video: …in your own home. Why am I doin’ it here in Hollywood? That you know “Look Around You” makes me happy. I’m wearing my kilt at work today. Och!